Unlike the post-truth Trump administration, the Canadian government isn’t in denial about climate change, and doesn’t shy away from using science to explain their situation: “Climate change during the 21st century is expected to result in more frequent fires in many boreal forests, with severe environmental and economic consequences... this could potentially result in a doubling of the amount of area burned by the end of this century, compared with amounts burned in recent decades,” states the B.C. government’s website, summing up the precarious situation succinctly. And there’s little question that things in B.C. are heating up: since 1900, average temperatures in the region have already increased 2.5 degrees Fahrenheit, and are expected to grow another 2.3 – 4.9 degrees by 2050 (these trends extend beyond B.C. ; the Earth as a whole has experienced 15 of the 16 hottest years ever recorded since 2000). As Quinn points out, climate change isn’t just making the region hotter, it’s also anticipated to generate wetter winters and dryer summers. The changes in rainfall patterns would likely reduce the areas snowpack, which feeds rivers and waterways deep into the hot summer months. The result would be dry periods becoming even dryer, turning the forest into a box of tinder. “The Mountain Pine Beetle is a native species of beetle that infests pine trees; after the beetle kills these trees, the trees die and the needles turn red,” explained Dr. Perrakis. “The moisture in the needles dry up and… eventually what we’re left with are grey dead trees.” Across Canada, there are huge expanses of red and grey pine trees, evidence of past and present beetle outbreaks. Needless to say, areas with dead, dry needles and trees increase the risk of forest fires. Mostly dead lodgepole pine trees, a result of the mountain pine beetle epidemic in Routt National Forest near the Wyoming/Colorado state line, 2013. Photo credit: AP/U.S. Forest Service, Joe Riss. Beetle infested woods, with dry, dead trees, increase the risk of wildfire. Making matters even more complicated, fighting the subsequent forest fires might actually help spread beetle infestations; stopping fires allows pine forests to reach an over-mature age, which makes them better hosts for beetles, increasing the rate of attacks. 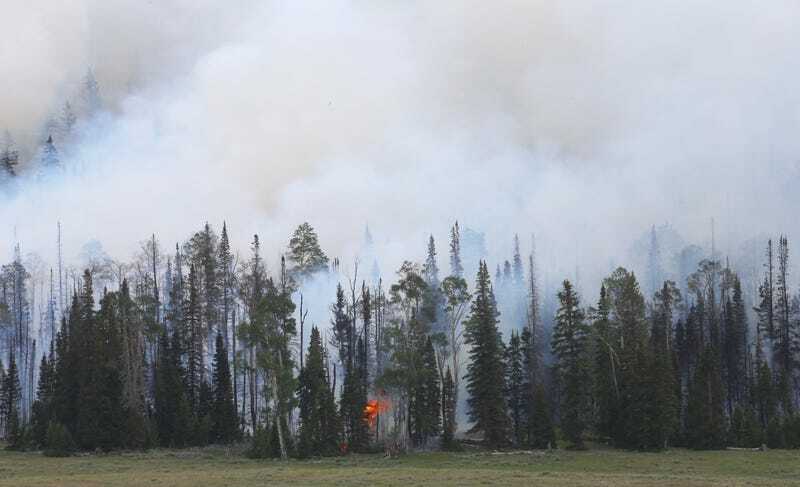 The Catch 22 is that while a few good fires would clear out much of the flammable undergrowth, communities are now living in and around many of these forested areas; if the fires were left to their own devices, they could have devastating consequences. Both Quinn and Dr. Perrakis point out that a lot of good could be done with more money going to protecting the urban-wilderness interface, tightening up building codes and clearing out the understory near B.C. communities. Researchers across the U.S. are reaching similar conclusions, asserting that putting out wildfires might be a mistake and that money might better spent in community fire-safety infrastructure projects. For now, the B.C. region is still fighting its largest fire season to date; thousands have been evacuated from their homes, almost $250 million has been spent trying to stop the great burn, and the resulting smoke has blanketed huge parts of Western Canada (and parts of Washington) in a hazy smog.